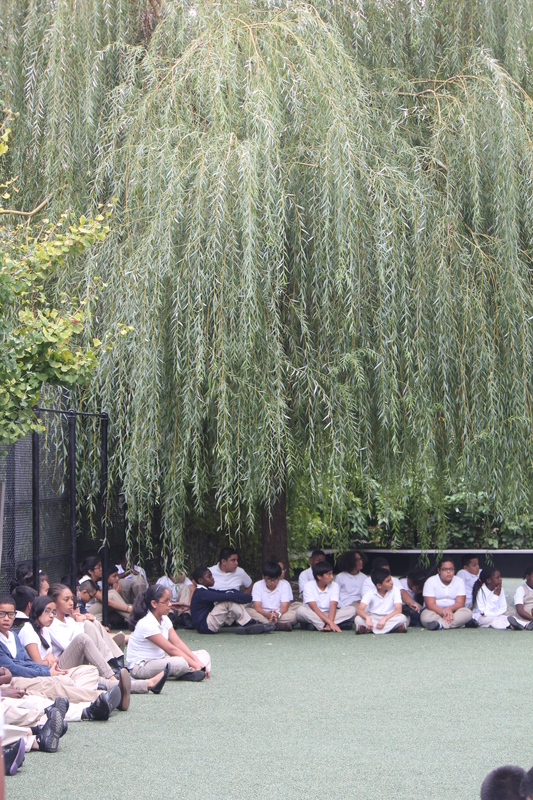 The East Harlem School is committed to assuring that our graduates can act with power that is guided and balanced with virtue. Character has consistently proven, within our school and in the larger world, to be a better predictor of a fulfilled life than conventional academic grades. While all elements of our program work together to help our students become good people, we also formally work with our students on their skills in the arenas of self-mastery and positive engagement with others. 7th graders meet weekly with our Head of School for an advisory period largely dedicated to formally exploring and developing these skills, and we send home report cards evaluating students in these specific areas. Below is our school vow, which we recite together, twice daily. We think it is a pretty clean and secular reminder of what it looks like for a life to go well – if we really keep to it! I vow to be aware of the world and all I think, say, and do. With this awareness of the world and all I think say and do, I promise to honor and protect myself, my family, and all others.